It wasn't looking good. My erstwhile online opponent was sinking balls left and right. A red. A yellow. Some other color. After a seemingly endless run of the table he finally missed his mark, giving me the opening I needed. I lined up the green ball with the side pocket, pulled back my cue, and sunk it more tragically than the Titanic. Did I mention I'd never played snooker before in my life? Up until I played Namco Bandai's Pro Pool Online 3 for Windows Phone 7 the sum total of my snooker knowledge came from watching episodes of British sketch comedy That Mitchell and Webb Look, which only featured the actual game for seconds at a time. Most of the more popular pool video games I've played have included snooker as an option, but I prefer playing billiard games in which having two balls of the same color on the table at a time means something has gone terribly wrong. It was Pro Pool Online 3's accessibility that had me try the variant for the first time. Well, that and an achievement that required I complete a single round of each game type — 8-ball, 9-ball and snooker. My hideous performance is not at all indicative of the game's ease of use. Colored arrows emanate from the balls as you line up your shot with your fingertips. A fine-tuning bar allows for pinpoint precision. Add a little English if you feel like getting fancy, pull back the cue and release. There's even an indicator in ordered variants that tells you what sort of ball you should be shooting at, something I didn't realize until it was too late. The online portion of Pro Pool Online 3 is quite lovely, allowing players to play against each other for in-game currency used to unlock additional table surfaces, cues and venues. It takes a little bit of time for players to start populating the game lobbies, but I had no trouble finding an opponent willing to further punish my horrible win-loss ratio. 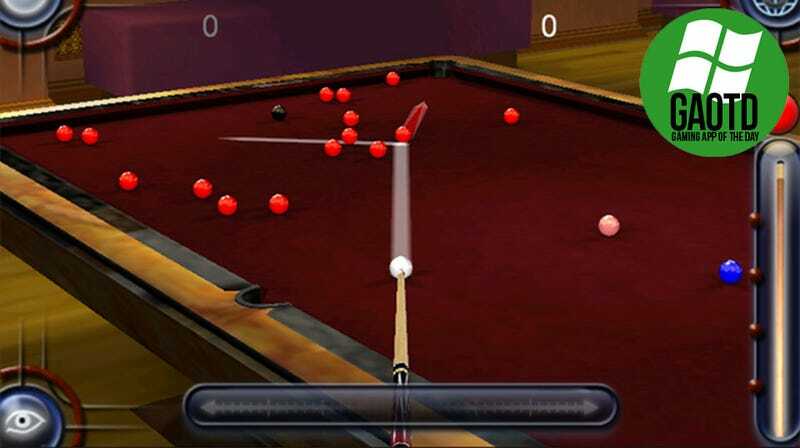 Like many newer Live-enabled Windows Phone 7 games, Pool Pro Online 3 isn't new to the smart phone gaming scene, having been released on Android last year and iOS so long ago that it doesn't even seem to be on there anymore. You can even try it for free on the PC, should you so desire. But hey, it's new to us, and an entertaining way to add valuable I-Play-Games-A-Lot points to that score dealio.